The Five of Swords represents the dangers of absolute dedication to a task in the Minor Arcana. The prize has been won, and you have done whatever was necessary to reach that goal. But you’ve likely hurt others in the process with your unremitting dedication to your purpose. This Rider Waite tarot card represents the consequences of your actions. 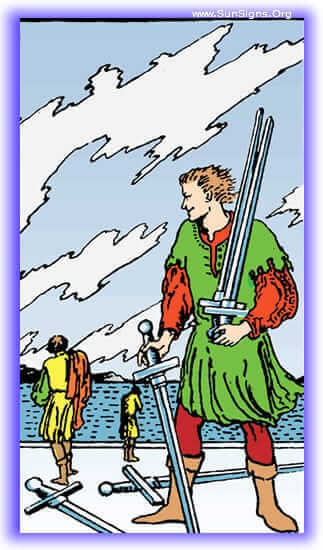 The Five of Swords upright represents conflict with others ultimately culminating in what appears to be a victory. You may notice after this victory that those who were your allies are now stand-offish, distrusting, or not as interested in being near you as you were before. In the end, having achieved your goal, you may lose everything. If this tarot card is in your past in this position, you may notice that while you successfully accomplished a goal you set out to accomplish, you are finding yourself mysteriously alone. You stepped on toes and hurt feelings to get here, and you may have to own up to that before it changes. Take care in your current situation, you’re very interested and dedicated in being right, but that may not be the most important thing. A victory for everyone will require you to step back and reconsider your position, and perhaps compromise on some of what were your personal goals, so that everyone can succeed. Beware of the unseen hand. With the Five Of Swords your future it is likely that there is a deceiver in your midst, who at some critical point will prove to be untrue. At this point the best thing you can do is move carefully and watch those who you are working with, and secure your situation against being too vulnerable to ruin from within. There comes a point in a conflict when you might recognize that there is no real victory for anyone involved. Everyone is pouring in their energy to succeed their way, and no one involved will come out with the results they hoped for. 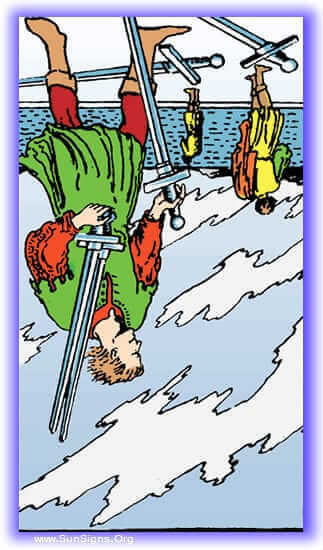 The Five Of Swords inverted calls for a return to the peace of the warrior in repose, and begin negotiations. With this tarot card appearing in the past it represents that you have long since been done with the fighting and strife in the situation. The fighting had ended, and negotiations have taken place allowing this project to move forward over the last few months. In order for the current situation to be resolved, the conflict must come to an end. With this card showing up, it’s indicating that it will be necessary for you to extend the olive branch. Put an end to the conflict afflicting this situation. Time to rest, and meditate on the situation with those involved, with the purpose of peaceful resolution. The project you’re in is moving along fairly well right now, but there is going to come a time in the near future when you will need to step up and call down the fighting. If you do not take the step to prevent the fighting from starting, then the project will come to a halt, and perhaps fall apart entirely.